One problem that shelters face is dogs overheating in hot summer months. Many animal shelters are outdoor facilities which are exposed to the elements, but even indoor shelters can rarely afford to keep an entire facility air conditioned. Also, due to space confinements shelters are often forced to keep dogs close together or place multiple dogs in one enclosure. This extra body heat means that dogs heat up even faster. When dogs are overheated, their heart rate increases and their lungs begin to work harder to bring in extra oxygen. Unlike humans who sweat almost everywhere, dogs only sweat from areas not covered by fur, so panting is about the only way they can release extra heat. During panting, when a dog opens its mouth and sticks out its tongue, it breathes in through its nose and out through its mouth. This makes air pass over the tongue which evaporates saliva and moisture and cools down the tongue. This process eventually spreads the cooling effect throughout the body. 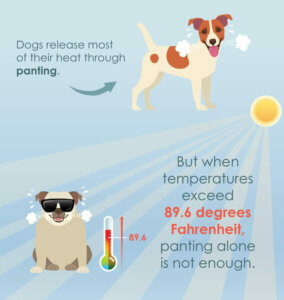 But when temperatures exceed 89.6 degrees Fahrenheit, panting alone is not enough. Heat stress and heat stroke may occur. Dogs become lethargic, have upset stomachs, pass out or even die if the situation is left unattended for too long. Implementing misting systems in animal shelters is an excellent solution to combat heat related maladies. Koolfog systems have been installed in shelters across the US and are an effective and proven strategy for keeping dogs comfortable in extreme conditions. Sonoma County Animal Services installed a Koolfog system in their indoor dog enclosures and has been pleased with the results. The process is this. Operating at pressures of 1000 psi+ Koolfog produces micron-sized water droplets that, while evaporating and turning to vapor, removes heat from the air, cooling the surrounding area. The dry fog produced by a Koolfog system reduces temperatures by as much as 35 degrees Fahrenheit, which makes even 100+ degree days comfortable. Systems are customizable and can be expanded to fit large common areas or designed to target individual spaces. Our systems have been proven to help keep animals safe and comfortable, even in extremely warm temperatures.